The Beach Rotana Abu Dhabi has unveiled an exciting new addition - the Beach Rotana Residences, a luxury extended stay property adjoining the hotel. The new addition to the iconic Beach Rotana transforms the hotel with a sprawling choice of world-class hotel rooms and longer stay apartments. 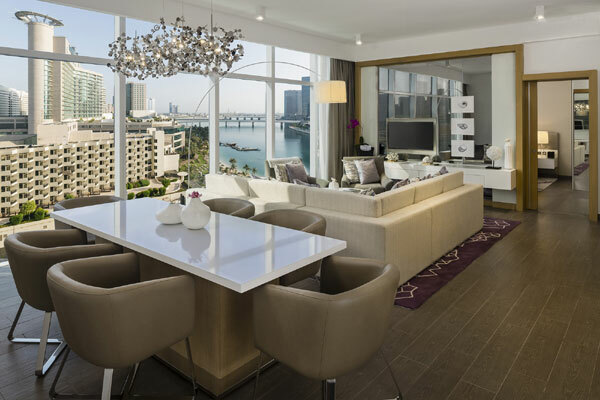 Named the Beach Rotana Residences, the modern tower houses 314 beautifully furnished one-, two- and three-bedroom apartments overlooking stunning vistas of pristine beach fronts and urban cityscapes. “The Beach Rotana Residences are an exciting addition to the premium market designed with the discerning customer in mind. It is a five-star short and extended stay property that offers the experiences of the modern, urban hotel and combines it with the conveniences of a comfortable home residence,” said Mathieu van Alphen, general manager. The long-awaited opening of the Beach Rotana Residences heralds a new era for the flagship hotel, which already offers a range of long-stay apartments through its sister property, the All Suites. However, the addition of the new Beach Rotana Residences catapults the Beach Rotana to an unmatched position in both hospitality and Mice (meetings, incentives, conferences and events). With 879 units in total, the complex also gives access to 14 restaurants, 12 banqueting rooms, three outdoor venues facing the waterside and two ballrooms with a capacity of up to 1,100 people.